Studies show that 40% of veterans struggling with their mental health aren't being treated for it. Sponsored by The Cohen Veterans Network. SEATTLE — The Cohen Veterans Network aims to help the more than 500,000 veterans who live in the Puget Sound by offering mental health support regardless of a patient's ability to pay. 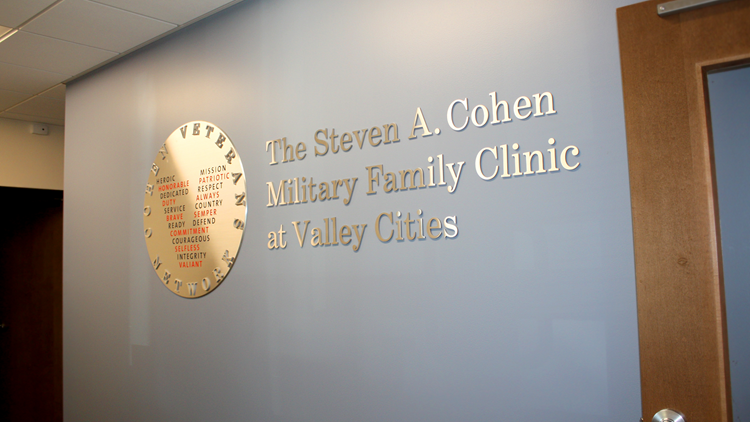 On March 22, The Cohen Veterans Network will host a grand opening of The Steven A. Cohen Military Family Clinic at Valley Cities in Lakewood, where they'll offer services to post-9/11 veterans and their families. "I could tell you that we have a problem with access to mental health care in America period," said Dr. Anthony Hassan, CEO of the Cohen Veterans Network, "But for veterans and military family members, Mr. Cohen said this is his focus. He wants to make sure every veteran and every family member can get the care they need when they need it." "Over half my staff is military veterans and military family members, including myself," said Valley Cities Clinic Director Nichole Ayres, "This position at the Cohen Veterans Network with this clinic as a military spouse and as a mental health profession, it's my dream." "We really want to decrease the barriers to care," Ayres said. "There are so many barriers that veterans and their families face and if we can provide low to no barriers, we want to do that." "We'll see a veteran after one day of service," Ayres said. "We've been trying for years and years to reach out and say 'try and get help now before your behaviors start impacting your duty performance or your relationships.' It's just so hard," Dr. Hassan said. "We really are trying to convince them getting help early is the best thing for your life, for your family, for your career." Visit the Cohen Veterans Network's website to learn more about their organization. If you're a veteran or military family member and someone you know needs care, call the clinic at (253) 215-7070.